Time is precious. To-do lists are long. With cooking, cleaning, lawn care, repair projects, and watching the kids, keeping your car clean often falls to the bottom of the list. Our menu items #1, 2 & 3 are washes and our menu items #4 & 5 are details. What’s the difference you ask? Check out our explanation below. Remember how clean your car was the first time you sat in it? Spiffy Details get you back to that like-new, mint condition. Deep cleaning inside and out restores your vehicle, and Spiffy Hand Polish Wax shines and protects for months to come. We recommend a Detail every 12 months. A Wash maintains your car throughout the year to keep it looking like new. Spiffy washes cars by hand with the best professional, environmentally-friendly products for your exterior and interior. We recommend a Spiffy Car Wash once a month with a Wax upgrade 3 times a year. Spiffy Technicians love cars. They take pride in their work. They always strive to make clients smile. When you wash with Spiffy, you can trust that your car is in the hands of experienced detail technicians. With over 100 hours of training, background checks and full insurance policies - you can be sure that Spiffy technicians are the best choice for your vehicle. 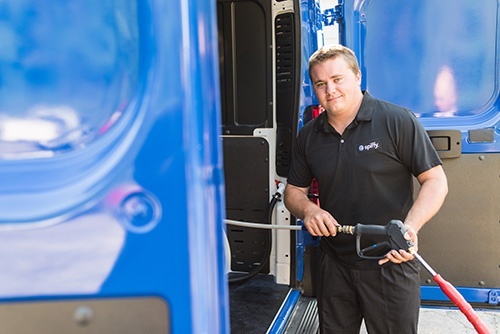 Wes has been a Spiffy Detail Technician since we launched in 2014. He has completed over 500 5-star services, like many of our top Technicians. Wes drives a black FJ that he could talk about for hours. He loves it & will love your car too. Aaron joined Spiffy in 2015. He drives a blue Honda Accord that looks as good as the day he bought it. Aaron has completed over 300 5-star services, and is looking forward to delivering your 5-star service, too. We wash your vehicle on the Spiffy Wash Mat, keeping your driveway free from runoff and chemicals. We also reclaim all of the water and take it with us when we go. All of Spiffy’s chemicals are tested to ensure they are both eco-friendly and high-quality. Spiffy’s water saving technology allows us to use half the water of traditional car washes. Spiffy also leaves behind zero run-off, unlike your Saturday DIY wash, which leaves soap and chemical run-off in the environment and typically uses 5 times the amount of water. We remove all pet-hair with in-depth carpet vacuuming and brushing. Complete high-pressure clean of your vehicle's undercarriage - removes road grime, salt & other alien material from under your car. Dramatically improves your windshield visibility by forcing water to ‘bead’ and roll off the car - also great for reducing glare. Spiffy is available in the greater Raleigh-Durham and Charlotte North Carolina areas, as well as Atlanta, GA, Dallas, TX and Los Angeles, CA. Enter your zip code, and we’ll let you know what services are available in your area. For real though, can't sing @GetSpiffy's praises enough. My car was in bad shape & I kept putting off a detail. Having them come to me was FIRE! I've been using Spiffy now on my Jaguar for about 18 months and they're really great! Previously, I'd used smaller operations to come clean my car and it was consistently a hassle in terms of scheduling and quality of service. That has never been the case for me since I started using Spiffy; I've literally been 100% satisfied over the course of many visits. Highly recommend.